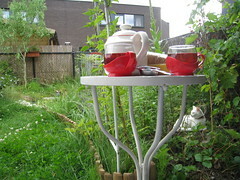 I had invited the neighbour across for a cup of tea as it was her first day of her holiday, but her kids were watching a movie so she was shooed out, poor thing While I was putting the tea things out, the white cat – don’t know her name, but she’s bold as brass – didn’t move an inch. It’s funny how a lot of the neighbourhood cats like to come and snooze in our garden, maybe there is a certain ‘ambiance’ they like? 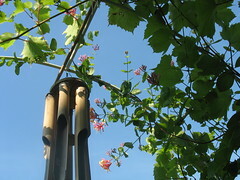 The garden needs attention, but it’s just too hot to lift a finger. 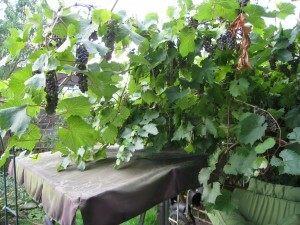 Everything is lush and green and there’s even one bunch of grapes that’s colouring purple!! Full set of the garden pics here! 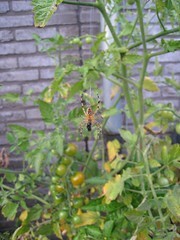 Food for everyone – that spider has a fly and my tomatoes finally seem to be ripening. That storm 2 nights ago seem to have affected the leaves, it can’t be they haven’t had enough water, it was like the second flood… Talking about spiders, they’re everywhere – I thought September was the spider month, they’re too early! Another result of global heating? Rein's Cookumentaries and other Stuff is powered by	WordPress 3.3.1 and delivered to you in 0.202 seconds using 42 queries.